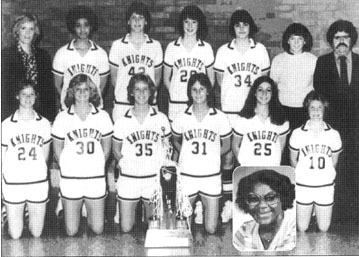 Before the 1982-83 girls high school basketball season began, Richwoods coach Mary Kay Hungate said: "We decided that we were going for the whole thing. We wanted an undefeated season and we wanted a state championship." Ending the regular season 24-0, the Lady Knights swept through the state tourney field for eight more wins and the first state basketball championship for a Peoria school. Ranked seventh nationally and third in the state, Richwoods bowled over Stephen Decatur 72--45 in the super sectional and, led by brilliant center Nora Lewis and Tracy Krick, swept through the eight-team state field. Naperville North was ripped 63-40 (Lewis 23 points and 11 rebounds), Chicago Marshall was outgunned 49-43 (Lewis 25 points and 13 rebounds), and Chicago Maria was handled 56-43 in the title game (Lewis scored a record 28 points including the last 11 scored by the Knights, while Krick had 19 points). Lewis scored 76 points and had 32 rebounds in the state finals while Krick scored 46 points with 23 rebounds. Both made the all-tournament team and Krick set two free throw records in the title game, making nine to tie the record and trying 14 for a new mark. Richwoods set a state record for the most field goal attempts, 55, and for field goal percentage, .555.